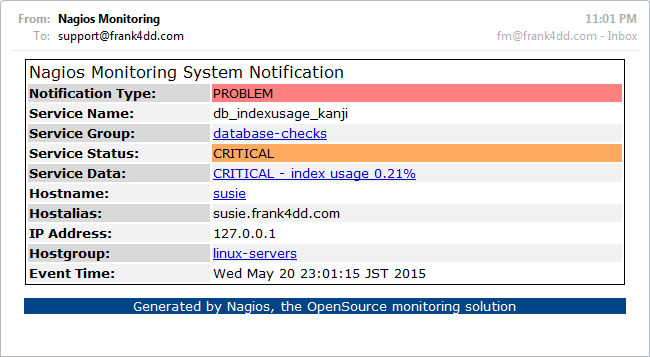 This script takes over the Nagios service e-mail notifications by receiving the Nagios service state information, formatting the e-mail according to various flags and sending it out through an SMTP gateway. text - The notification script with its most basic use, English language and plaintext notification. 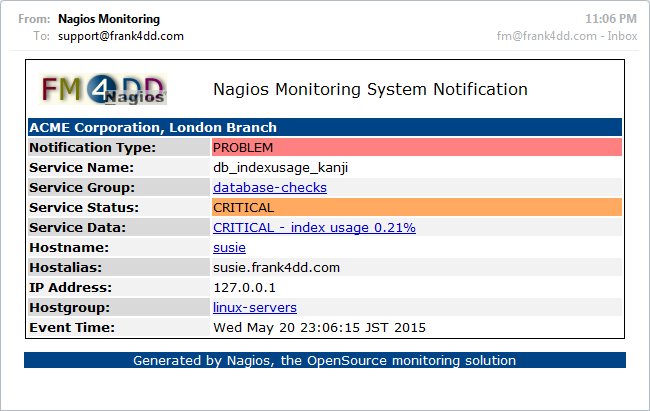 html The same example notification using the -f html and -u options, formatting the content as HTML with links to Nagios. multi - A similar example notification using the -f multi and -u options, formatting the content as S/Mime multipart HTML and adds the logo image. graph - Performance Graphs: Since version 1.4, 'nagios_send_service_mail.pl' is able to pick up RRD perfomance data and include a on-the-fly generated graph image with the notification. This works with Nagiosgraph v0.9.1 and possibly also with later Nagiosgraph versions. If Nagiosgraph is not available, then it is best to use only the notification formats 'text', 'html' and 'multi'. main: trying to create the Nagiosgraph image. Color Coding: Below is the color code table for the notification type and service states. Color can be easily adjusted by setting the %NOTIFICATIONCOLOR values to a different RGB code. 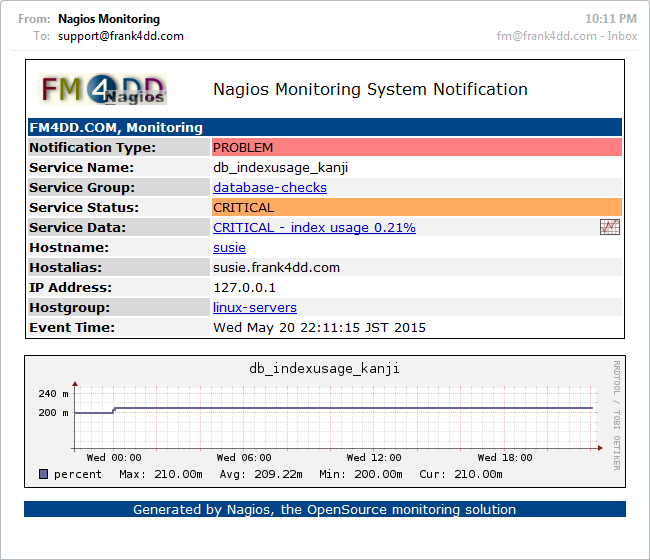 nagios_send_host_mail.pl - The Nagios monitoring script for hosts with Nagiosgraph can be found here: nagios_send_host_mail manual.